The word “laboratory” conjures images of test tubes, chemicals, beakers, and white coats. Place Lab, however, is a very different type of laboratory—one that reimagines spaces. Seeking to catalyze mindful urban transformation and creative redevelopment, Place Lab is part of the University of Chicago’s Arts + Public Life initiative, directed by Theaster Gates. This multidisciplinary group—composed of an architect, a lawyer, an artist, and an activist—seeks to explore the process of reinventing underused buildings and empty lots to better serve community needs. Its new exhibition at the Washington Park Arts Incubator, “PLAT | FORMS,” intends to jumpstart their enterprise and introduce the community to Place Lab. The exhibition, which stretches beyond the walls of the space into the surrounding block, is introduced through a series of totem poles composed of salvaged wood and scrap metal facing Martin Luther King Drive. The poles act like sentinels, inviting visitors and residents to explore the transforming street. At the adjacent Green Line stop, a glowing wooden lighthouse structure stands ringed by circles of tree stumps—an unexpected gathering spot located next to an old garage and empty lot on Garfield Boulevard. Although the “PLAT | FORMS” exhibition showcases a diverse group of artists—including the creator of these odd assemblages, Stephen Burks, as well as David Adjaye, Sara Pooley, and others—its main goal is to translate Place Lab’s work into a space that is engaging, asking critical questions, and involving the community. In order to do so, the gallery space is transformed into a variety of separate elements—a . The platform serves as a symbolic invitation for community members to step up and directly collaborate with Place Lab’s four leaders, who will be hosting office hours from 12pm to 5pm over the next seventy days. Anyone can come in to ask questions, give feedback, and play a role in building their community. The talking chamber, a sheltered area with recording devices and headphones that play excerpts from a local radio show, is another place where visitors can record their stories and provide feedback about the changes they would like to see. “PLAT | FORMS” is just the first step. With a grant from the Knight Foundation for the next three years, Place Lab hopes to gather opinions in order to plan further activity in underutilized and abandoned spaces. 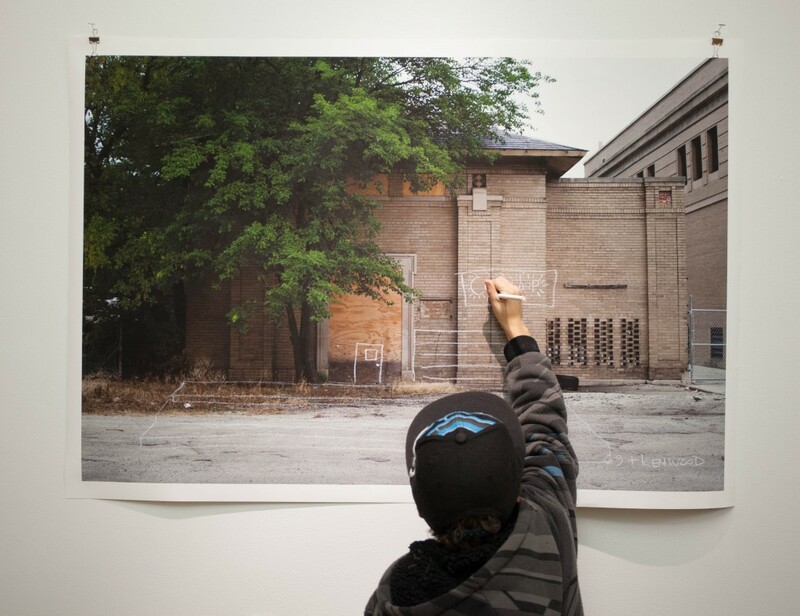 In this vein, Place Lab will host a series of three conversations called “GROWING PAINS” on public art, public schools, and public housing over the course of the next three months. Through this collective conversation, the initiative will work toward its goal of transforming crumbling areas into vibrant and welcoming centers of arts and communication—in essence, transforming spaces into places. “PLAT | FORMS.” Washington Park Arts Incubator, 301 E. Garfield Blvd. Through January 2. (773)702-9724. arts.uchicago.edu/artsandpubliclife.